Phytoplankton biomass expressed as chlorophyll a concentration reflects the changes in nutrient content in the marine environment. Based on phytoplankton biomass values, a trend of improvement has been observed. The state of Slovenian sea bodies is estimated to be good or very good. Measuring the concentration of chlorophyll-a is the most common approach to assessing phytoplankton biomass. Phytoplankton is a biological element that reacts well to the burdening of water bodies with nutrients. The indicator shows the values of ecological quality ratio (EQR) for phytoplankton biomass expressed as chlorophyll-a in the surface layer of the Slovenian sea. Chlorophyll-a is one of the elements used for assessing the state of the sea in accordance with European directives (Water Directive 2000/60/EC and Marine Strategy Framework Directive 2008/56/EC) and Slovenian legislation. Assessment of the ecological state in accordance with the Water Directive is carried out by identifying changes in the structure and function of an ecosystem compared to its natural state as reference conditions. According to its ecological quality, an ecosystem or a water body is then classified into one of the five quality classes of ecological state (Urbanič et al, 2013, Ministry of the Environment and Spatial Planning, 2016). The EQR value represents a ratio between the measured metrics value at the selected measuring site and the reference value. A higher EQR value represents a better state, or lower chlorophyll-a concentration. Phytoplankton biomass can also represent one of the indicators for monitoring of the effectiveness of measures intended to reduce the input of nutrients in the sea. To maintain a good marine environmental state. To maintain a good ecological state in the coastal sea. To maintain an appropriate quantity of nutrients in the coastal sea. Excessive amounts of nutrients in coastal seawater can have various negative impacts. Elevated concentrations of nutrients can lead to excessive propagation of phytoplankton, sometimes to the extent of harmful blooming that can cause the formation of foam, die-offs of benthic fauna, wild and farmed fish and the poisoning of people who consume affected shellfish. Increased phytoplankton biomass reduces water transparency, which can affect the maximum depth allowing growth of marine flowering plants and macrophytic algae, thus negatively affecting animal communities relying on affected habitats. On the other hand, the dying and decomposition of phytoplankton biomass may cause local hypoxia in the bottom layer, which leads to massive die-offs of benthic organisms. In addition to local hypoxia, reduced biodiversity and a reduction of areas suitable for fish farming can also accelerate the growth of yellow-green algae. In the European context, the Mediterranean Sea is considered to have one of the lowest chlorophyll-a concentrations (EEA, 2016). On the other hand, the Northern Adriatic Sea, which includes Slovenian coastal waters, is among the most productive parts of the Mediterranean Sea. This is mainly due to the fact that large rivers, such as the Po, the Adige, the Brenta, the Livenza, the Tagliamento and, ultimately, the Soča, with its mouth nearest to the Slovenian coast, flow into the Northern Adriatic. Compared to other areas of the Northern Adriatic Sea, a major portion of the Gulf of Trieste, particularly its eastern, Slovenian portion is a relatively nutrient-poor marine ecosystem (considering average annual values of sea water transparency and chlorophyll-a below 2.5 µg/l, the Slovenian coastal sea can be classified as oligotrophic according to OECD classifications) with signs of local overload, especially in smaller, semi-closed bays where municipal sewage is discharged. The state of overload was established by way of macroalgae assessment (Orlando-Bonaca et al, 2012a, 2012b). A relatively low nutrient content in the Slovenian sea is also reflected in its good or very good state regarding phytoplankton biomass (Figure MR4-1). 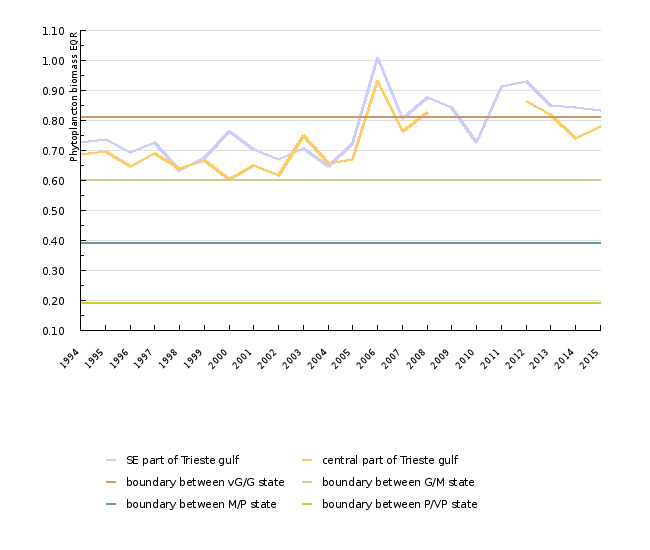 Two monitoring stations with longer data sets (the period 1994–2015) were selected to present this indicator: one in the central part of the Gulf of Trieste, which is under stronger influence of the Soča River, and the other in the south-eastern part of the Gulf of Trieste, which is outside direct influence of local land-based pollutant overloads (F). Within national monitoring programmes, samples for phytoplankton biomass analyses are taken at five monitoring stations, one in each of the water bodies making up the Slovenian sea (Figure MR4-2). Of these, four water bodies are located in coastal waters and one in the territorial sea (the CZ monitoring station). Within the framework of the Water Management Plan for the Danube River Basin and the Adriatic 2015–2021 (NUVII), where the ecological state is only being evaluated in coastal water bodies (one of them is the F monitoring station), the phytoplankton-based ecological state was evaluated at three coastal monitoring stations. According to the findings, they were all in a very good state. The area of the Bay of Koper is classified as a heavily modified water body. 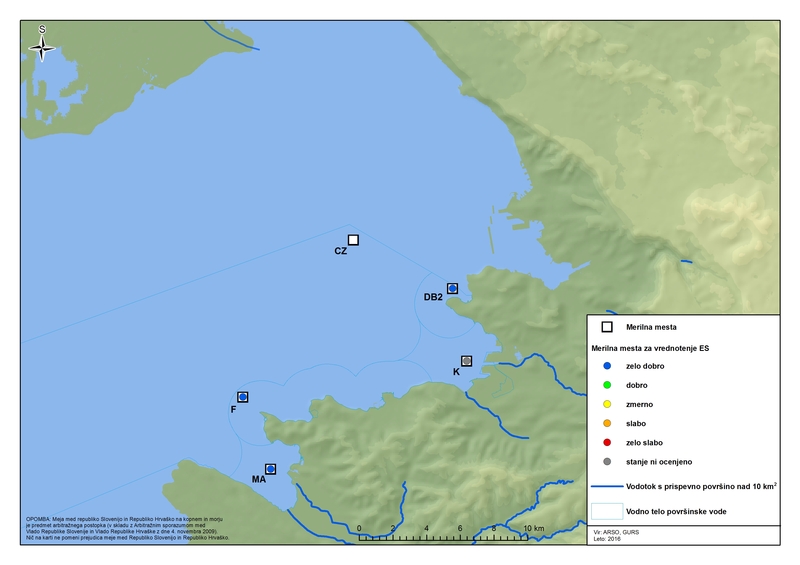 While its ecological potential is being assessed, the criteria for ecological potential of Slovenian coastal waters are still under development. An initial assessment of the state of Slovenian marine waters was also carried out within the Marine environment management plan. Based on chlorophyll-a concentrations measured at the CZ monitoring station in the territorial sea, the state of marine water at the station was assessed as good. The values of phytoplankton biomass change from year to year, as they depend on variable river discharges and precipitation (Orlando et al, 2012b). Over the recent decade, researchers have observed a decrease in chlorophyll-a concentrations throughout the Northern Adriatic Sea (Mozetič et al, 2010, Mozetič et al, 2012). The state of marine water at measuring stations CZ and F with regard to the EQR value of phytoplankton biomass has improved from good in 2006 to very good in the years that followed. The decrease in phytoplankton biomass in the Slovenian sea coincides with the reduced discharge of the Soča River and the reduced quantity of nutrients carried by the Soča to the Gulf of Trieste (Mozetič et al, 2012, Orlando et al, 2012b). The trend of declining nutrient content has been observed in other water courses throughout Slovenia as well (indicator VD01), which may be a consequence of the construction and upgrading of sewage systems and wastewater treatment plants in the hinterland (see VD02 indicator), as well as the measures to reduce the content of phosphates in detergents (Köhler, J. 2006).